First of all, How CUTE is this plate?!.. I adore it so much! 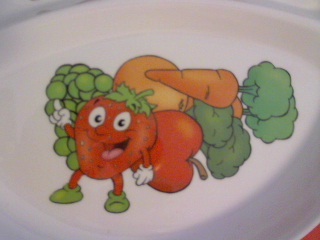 I was sent this sample plate from Super healthy kids. 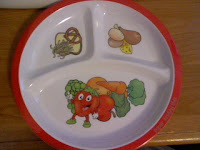 For all you mom's and dad's out there you know how important it is for your children to eat healthy right?..What about portion control?..Do you have that undercontrol?..With this graphic printed plate it's easy for you and your kids to learn portion control! It's also seperated for no spill overs. I always hated when i my carrot, green bean, or corn juice leaked over to my meat. Ick! .. This heavy duty plate is made of really thick plastic (100% Melamine ware), So even if your kids throw their plate across the room there might be a big mess but at least there will be no broken glass. Only down side is it's NOT microwaveable. your kids will wan't to eat all of their vegies and fruit to find this adorable strawberry figure on the bottom of their plate, Make it a game, Play hide and find the strawberry. Not only will your kids want to eat, But they will have fun while doing it! The left side being grains such as whole wheat bread, cereal, and noodles, oatmeal, popcorn, waffles, pretzels, granola, bagels, tortillas, and muffins it will be a easy and sure way to not over eat those carbs. The right side being protein, such as chicken, Beans, fish, and cheese and potatoes. the bright graphics will be a sure pleaser to any kid, They will keep them busy while eating. I wish i had something like this when i was a kid!. I receive no monetary compensation for this review. 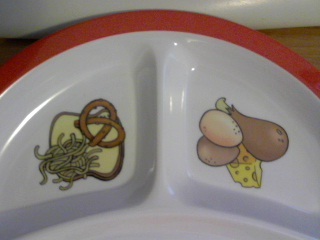 I was provided a kids plate to try and give my honest opinion.